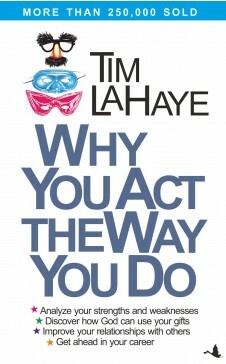 In WHY YOU ACT THE WAY YOU DO, Tim LaHaye explains his unique theory of temperament blends and tells how you can improve yourself by identifying your own personality strengths and weaknesses. 2. Enable you to deal with depression and anger. 3. Improve your relationship with your spouse, or help you select your future husband or wife. 4. Identify for you the specific spiritual gifts God has given you. Even if you've never before read about personality and temperament, Why You Act the Way you Do will help you discover your unique potential in your job, your marriage, and your church. Dr. Tim LaHaye is the author of twenty-one books, including Spirit-Controlled Temperament, Why You Act the Way You Do will help you discover your unique potential in your job, your marriage and your church. Dr Tim LaHaye is the author of twenty-one books, including Spirit-Controlled Temperament and Transformed Temperaments. A popular speaker on family life and prophecy he currently serves as an associate pastor at the Prestonwood Baptist Church of Dallas, Texas, where his family Enrichment Class is transmitted live via satellite to many churches each Sunday. He is president of the American Coalition for Traditional values in Washington, DC.